When we speak or sing, the sound comes from an organ located in the neck known as the larynx, commonly called the “voice box”. Our vocal chords are found within this voice box, and are made up of folds of tissue that vibrate to produce sound. Subtle variations in the thickness and length of these folds are what give us distinct sounding voices. Men typically have longer, thicker folds, which results in a characteristically lower pitched voice than women. You came here to improve your singing skills, so why does any of this matter? Understanding the way our bodies produce sound is the first step to singing like a pro. Once you grasp the underlying physiological processes, with some practice you’ll be able to use expert control and precision to fine-tune your natural vocal talent. Chin parallel to the ground. Hold your chest high, but not to the point of strain. Shoulders back. Weight of the body is shifted slightly forward. The diaphragm is a muscle that surrounds the lungs, naturally flattening and expanding as you inhale and exhale, causing your chest to rise and fall. If you struggle to hold a note, taking control of your breathing is a fairly uncomplicated solution, though it does take some practice. The image above illustrates the movement of our chest and diaphragm that occurs when we inhale and exhale. What does this have to do with singing? Everything—when we breathe we have control over the airflow leaving our body, which dictates the intensity of air pressure hitting our vocal chords. Resisting the natural movement of the abdominal region when we inhale and exhale gives us control over virtually all aspects of singing: volume (how loud we sing), pitch (the notes we are singing), vibrato (pulsating changes in pitch), etc. When you hear musicians talk about “singing from the throat”, what they’re referring to is singing without exercising any control over their breathing. When we control the air pressure hitting our vocal chords, this is called “singing from the diaphragm”. We can exercise control by using what veteran singers refer to as “support”. Support is defined as the repeated interaction of opposing sets of breathing muscles, which eventually trains the vocal chords to close upon reflex and remain closed as sound is produced, allowing us to sing without interference from nonessential muscles. 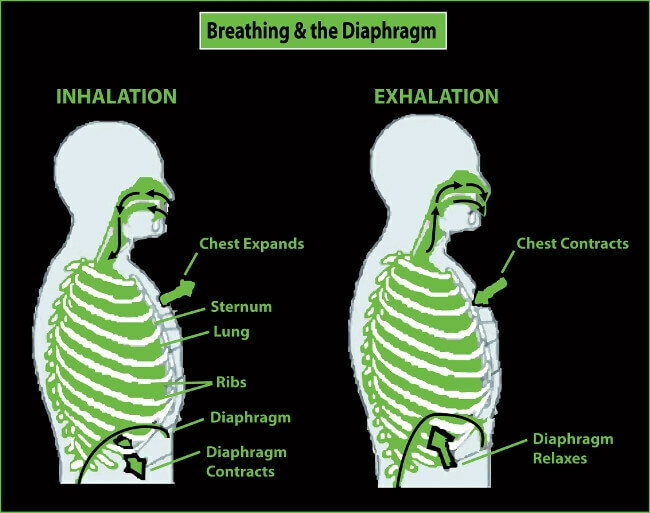 Notice in the diagram above that the diaphragm naturally relaxes when you exhale. 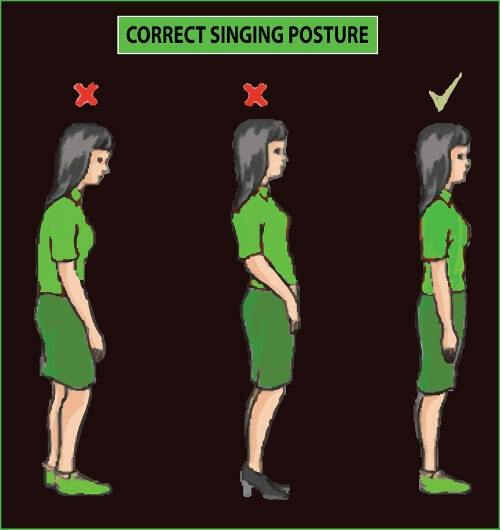 In order to sing with support, do the opposite: inhale, but force the diaphragm to relax by “pulling up” the abdominal muscles. Maintain this support for as long as you hold the note. Our body’s reflexive response to this resistance is to close the vocal chords, allowing us to produce a strong, clear sound. It’s no joke; singing from the throat can damage your voice and produce a harsh or nasally sound. Instead, you should aim to sing from your diaphragm, or from your gut. Adopting this singing technique will also help you hit those tough high notes, increasing your vocal range. One great way to learn how to do this is by laughing (seriously!). Let out a series of Ha-Ha-Ha’s, ensuring the sound comes from deep within your gut—the louder the better! This will strengthen your abdominal muscles, improving your ability to sing with proper support. When you play a given chord on a guitar or piano that hasn’t been tuned, the sound produced is like nails on a chalkboard. Listening to someone sing out of tune is similarly cringe worthy. Fortunately, ear training exercises can help us recognize when we’re singing out of tune. All you need to begin ear training is some basic knowledge of musical scales. A scale is a sequence of notes that fall within the same pitch. For example, the C major scale is C–D–E–F–G–A–B–[C] (with the second C in brackets to indicate that it is an octave higher than the first C). In the image below, the C major note (white key) on the far left is an octave lower than the C note in the middle. Start by playing a C-chord on guitar or piano in an octave within your vocal range (i.e. that you can easily hit without straining your voice), listening carefully. Now play the chord again, this time singing the note at the same time. If you’re singing in tune, your voice and the instrumental chord will complement each other, meshing together to produce an appealing sound. Move on to the next chord in the scale, continuing until you’re able to sing each of the notes in the correct pitch. Once you’ve mastered that, try playing and singing the notes out of order. Work your way up to higher and lower octaves (e.g. to the outer ends of your piano keys or the frets of your guitar), challenging the limits of your vocal range. Vibrato is a technique that will leave you with a polished, professional sound; an extra “something” that will leave an impression on your audience and show off your singing proficiency. Commonly used by winning contestants on shows like American Idol and The Voice, vibrato refers to rapid, repetitive changes in pitch (“oscillations”) that make for a richer, warmer sounding voice. This technique allows singers to showcase the level of control and precision they have over their vocal chords and diaphragmatic breathing. Vibrato is usually used at the end of a sung phrase, subtly emphasizing the voice. Similar to guitar or drum solos, too much vibrato detracts from your performance, and can be tedious for your audience to sit through. Contrary to popular belief, it isn’t something you add to your voice, but rather something that comes naturally with experienced singing as you strengthen and gain control over your muscles. It should never sound forced. The most important thing to remember when trying to develop vibrato is the mind-body connection. If you’re employing the proper posture and breathing techniques described above, vibrato will come with practice. Keep your vocal chords hydrated—be sure to drink lots of fluids throughout the day! Minimize tea, coffee, and alcohol consumption. Caffeine and alcohol dry out the vocal chords, and can make your voice sound raspy and coarse. Gradually work your way up to vocally demanding songs. While it may be tempting to start with Whitney Houston, pushing your limits without proper training will strain your vocal chords. You wouldn’t take up weightlifting and try to bench press 250 lbs. on the first day, right? Singing is the same in that respect; patience is rewarded. Very interesting article. Pretty cool.